Tiny Wynette Tiny House with loft, Vacation Rental at The Village at Flat Rock, NC, A Simple-Life Tiny House Community is now open and ready for your arrival! All brand new double futon, linens, comforters, pillows, many new items just for you to feel right at home! The design of this tiny house makes it extra special, from the wooden front door, to the cathedral ceiling, private bath with laundry and so many little cubbies to tuck your belongings for your week-end away or a month long stay! If you have not taken time out for yourself to explore this mountain area, and to experience tiny house living, make your plans today for the highlight of 2018! We believe you will feel welcomed right away, and we like to warn guests, you might fall in love with the Simple Life lifestyle here. You will feel welcomed and right at home from the moment you drive into this gated tiny house village/ This tiny house has a welcoming feel to it, the interior design is unique, and the owner has taken care of every comfort detail you want for a luxury feel- tiny house experience. 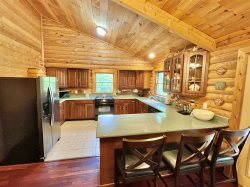 Its tucked in a nature spot but convenient to grocery stores, hiking; at The DuPont State Forest , Pisgah Forest and Glassy Mountain at Carl Sandburg National Park, so many local attractions like the Biltmore Estate, Sierra Nevada, Wineries and downtown Flat Rock, Hendersonville, and close to Asheville. Come here to experience tiny house living with your dog, under 80#, some kinds restricted per Simple Life, please ask. We had such a great time in the 'Tiny Wynette' ! What a beautiful home and fantastic setting. We met a lot of kind neighbors (and their dogs) and felt very much at home. Great time visiting Hendersonville and highly recommend checking out the Mountain Deli Restaurant (downtown Hendersonville). Thanks so much for a great first tiny house experience. Before discovering tiny houses I had always had an Airstream fantasy. I explored going that route before doing research and landing on working with Wishbone Tiny Homes of Asheville to build my house. I found out it was actually cheaper to stick-build a tiny house than having an Airstream rehabbed. Also, tiny homes allow for more personal expression because they are entirely custom. The process of designing my own house was thrilling and Wishbone turned out to be the perfect partners to achieve the level of quality and ingenuity I envisioned. I wanted my house to be highly functional and highly efficient in its use of space. Everything needed to double duty in terms of functionality. I'm an artist and so I also wanted my house to reflect my style, visual sensibilities and love of fine detail. Tiny Wynette is not really a tiny towable because she is 10' wide as opposed to the typical 8.5. As I knew I was not going to drive my house around behind a truck in some kind of Tiny House Nation fantasy, I opted to go the extra foot and a half in width. Tiny Wynette is therefore considered an 'oversized load' when transported and she is insured as a manufactured home or park model by American Modern. *More Details about the House in your Welcome Book at Tiny Wynette to read during your stay. *Tammy was a little bit country and a little bit uptown, like my house. *I love a good play on words. Brand NEW Full, Comfy Futon in the Loft with fresh linens, pillows and comforter with duvet. Brand new Cooler to fill with ice for your extra beverages!